Our customer BAE Systems Marine needed a facility that would become a centre of excellence; Boldman was approached by the customer to design, manufacture and install bespoke welding cells and protected work areas. The pipe shop was crucial to the whole project: at the time it was only delivering 45% of components on time and had a massive backlog of pipes classified delinquent or behind schedule. The facility required a complete refurbishment to improve productivity, but had to maintain an output of around 220 pipes a week throughout the refurbishment process. As part of the £1.2m refurbishment to transfer the production facility to production cells, Boldman designed and installed bespoke welding cells, protected work areas, supervisor offices, protective screening and small bore pipe transport trolleys to save man hours in the facility. Manufactured from our range of standard off the shelf aluminium profiles and fittings, the enclosures and cells were constructed using various infill panels, welding screens and welding curtains to the front and sides of the cells, to provide total safety to operators and observers, in and out of the cells. 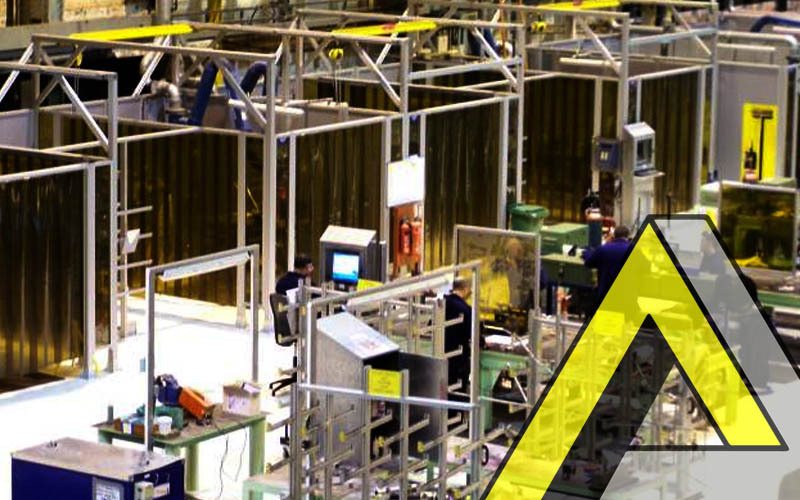 The modular nature of the Boldman welding cells and guarding systems gave BAE the flexibility and adaptability to have the cells installed quickly with minimum disruption to production. Since the refurbishment, man hours have fallen from five to three. The longest lead time for any pipe is now two weeks. BAE Systems was so impressed with the improvements made to the Barrow site by Boldman’s ability to design, manufacture and install, that it is now rolling out cellular manufacturing in other areas of production including the refurbishment of the sheet metal shop.